¿Panqueques con harina de gusanos? ¡Que rico! 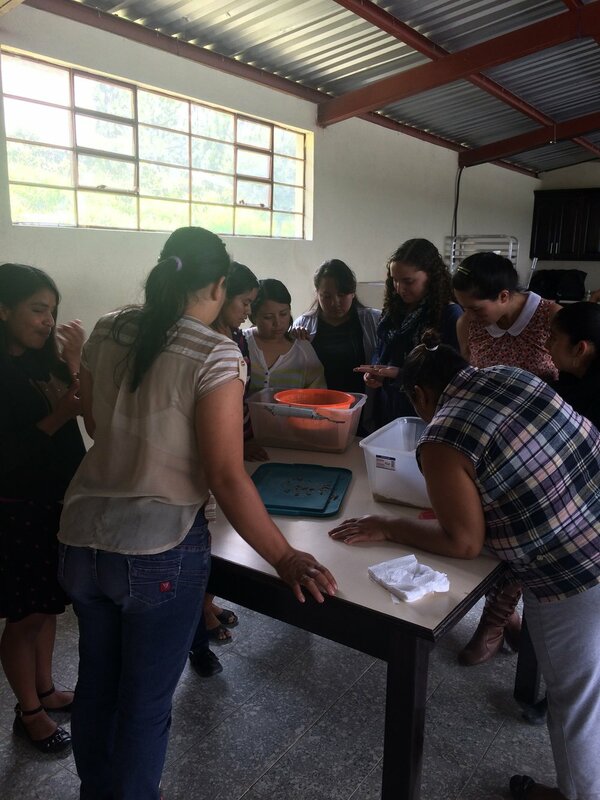 In June, MealFlour prepared delicious mealworm protein-packed foods with the participants in our train-the-trainer program in Huehuetenango. The community leaders learned how to make simple banana pancakes and bean dip with mealworm powder. Try the dip for yourself with the easy recipe in the photo (left)! Last month, MealFlour welcomed three new interns to the team for the summer - all from the University of Chicago! Jessica Mora and Symphony Fletcher are rising second years joining us through the Metcalf internship program. Sebastian Otero is a UChicago Human Rights fellow who will be working for both MealFlour and our partner clinic, Primeros Pasos. Sebastian will be conducting a survey study on the conception of food security in the Palajunoj Valley, a collections of communities outside Xela. Follow us to trainings, catch glimpses of beautiful Guatemala, and learn about sustainable protein farming. Search 'mealflour' or use the snap code (left). Don't follow our snaps or new to the platform? Check out a sample of the channel, taken by our intern Sebastian on June 26 (video left). MealFlour was a finalist at the 2017 Classy Awards and attended the Collaborative event from June 13-15 in Boston. Our story was featured as a 'Venture Spotlight' in the International InsectCentre newsletter - check it out!